(CNN) -- Barely an hour's drive from the casinos of Las Vegas, a group of unassuming buildings have become as important as the trenches were to WWI. The big difference? Today's warriors are fighting without getting in harm's way, using drones to attack targets in Afghanistan and Pakistan. Remote-controlled drones, such as the Predator, are proving increasingly popular with the U.S. military. U.S. Air Force fighter pilot Major Morgan Andrews is one such combatant. He kisses his wife goodbye, drives to Creech, a tiny desert air force base in Nevada, and within minutes could be killing insurgents on the other side of the world. Andrews fights not from the seat of the F16 he joined the air force to fly but from a darkened ground control station. He pilots a remote-controlled Predator, a UAV (unmanned aerial vehicle) which can spy on and attack positions and personnel without risk to its controller, shooting deadly Hellfire missiles at enemy fighters in support of fellow soldiers. "You're talking to them on the radios as if we were in a normal airplane flying overhead," says Andrews. "You see the imagery, you know what's going on, you see what you're looking at. It's very easy when something like that is happening to project yourself there and feel a part of the battle. Like I said, your heart starts racing a little bit." Is remote-controlled warfare a good or a bad idea? Tell us what you think. Meanwhile, intelligence analysts get to see images in real time and can identify personnel on the ground. There are now more than 7,000 UAVs ranging from the workhorse, the Predator, and its beefier, deadlier kin the Reaper, to army drones like the tiny hand-launched Raven and the larger Shadow. 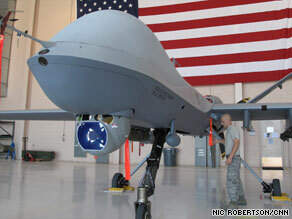 The drones are dramatically tilting the war in favor of the United States. Predators, for example, played a key role in killing al Qaeda in Iraq leader Abu Musab al Zarqawi in 2006. UAVs are credited with killing more than half al Qaeda's top 20 leaders. For this month's World's Untold Stories Nic Robertson takes us inside the revolutionary world of robotic warfare and UAVs, better known as drones. Now U.S. Secretary of Defense Robert Gates wants more UAVs. Already he has said that the next generation of fighter planes -- the F-35 that took decades to develop at a cost of more than half-a-billion dollars each -- will be the last manned fighter aircraft. Lt. Gen. David Deptula, USAF, explains that the next phase will enable a single drone to provide as many as 60 simultaneous live video feeds directly to combat troops. Some new drones will be as small as flies, others walk -- all appear destined to work with decreasing human input. Robotic warfare expert Peter Singer, who advised President Barack Obama's campaign team and has authored "Wired for War," says that remote warfare is changing mankind's monopoly on how conflict is fought for the first time in 5,000 years. All that limits its advance is its application, not the technology. "The barriers of war in our society are already lowering," he says. "This tech may allow them to lower to the ground. And we might already be seeing this in the strikes being carried out on Pakistan." He points out that raw numbers over the last year show the same number of strikes as the opening of the Kosovo war. "But we didn't debate about it in Congress, we don't talk about it daily in our media." Pakistani officials say drones are killing al Qaeda leaders who thought they were beyond U.S. reach. But even the U.S. government admits civilians are dying in those attacks too. Singer fears the use of drones is misunderstood as cowardice, undermining the effectiveness of attacks and ultimately losing the war UAVs are fighting. He explains that last year one of the most popular songs in the Pakistani charts talked about America fighting without honor, adding that the U.S. is "getting better and better at targeting leaders but perhaps creating a context that gets more recruits." The spokesman for Taliban leader Mullah Omar recently told me that it is not afraid of drones, that it doesn't fear death. Deptula disagrees and quotes recently declassified comments between two Taliban leaders: "Tanks and armor are not a big deal, the planes are the killers." He says that of more than 600 Hellfires fired by Predators, over 95 percent hit their targets. Those that failed did so generally through mechanical fault, loss of guidance or a target moving at the last instant, Deptula says. Singer cites other instances when a computer fault has turned robotic warfare into a mass casualty event. "Last year in South Africa an anti-aircraft had a 'software glitch' during a training exercise," he says. "It was supposed to fire upwards into the sky, instead it lowered and it fired in a circle and killed nine soldiers, all because of a software glitch." For the U.S. military the gains more obviously outweigh the glitches. Hundreds, possibly thousands, of service men and women have had limbs and lives saved by bomb-detecting bots. Conservative estimates say that fighting from home and putting robots in to war has saved hundreds of millions of dollars. At Creech the demand for Predator pilots is so intense that it is mobilizing Air National Guard and reservists. It has also introduced an experimental training program for air force cadets from the videogame generation. Colonel Chris Chambliss, based at Creech, explains: "If you look at younger people right now, they multitask much better than I do. They can do a lot of things with a lot of different information, gather all that in. That's certainly a skill set we need." Cadet Greg Groves, who is in the Reserve Officers' Training Corps, has never flown a plane before -- but is well aware of his responsibilities. He says: "It's pretty clear that it's not a video game, and it is real life and that what I do directly affects someone else halfway around the world. So I don't think that's going to be a big problem for me." Groves' father and grandfather were both in the military: when he leaves for Creech he'll be the first in his family to go to war without fear of dying. Some commanders, such as Colonel Baxter Swift, based at USAF Balad in Iraq, says the future has only just begun. He says: "It's almost like what the hot air balloon was back in the Civil War for us. 'Hey, I can rise above and look around and see what the forces are doing on the battlefield.' So now we are just in the pioneering stage." For his part, Singer draws another historical parallel, comparing the U.S. and the UAV to the British invention of the tank in the early 20th century. "There is no such thing as a permanent first maneuver advantage," Singer says. "The British came out of WWI with the most tanks, they invented the tank and yet they didn't figure out the best way to use it in the wars they would be fighting. It was the Germans that figured that out and it was the Germans that would be fighting and would win with the tank when WWII starts."